You don't have to pay retail to get the look of luxury for your patio area. Buying through discount online retailers and local retailers during seasonal sales is a great way to build an outside living space for a fraction of the cost. Online retailers can offer steep patio furniture and cushion discount due to low overhead. Many online retailers have these items in stock in massive warehousing systems as well as direct shipment from the manufacturer to customers. Most offer free shipping with other shipping options that might include white glove, unboxing and shipping crate removal. These shipping options make it easy to take advantage of what is sometimes as much as 50%-75% discount savings. Over 600 patio dining sets, sectionals, fire pit sets, tables and chairs come in a wide selection of styles and are available in wicker, aluminum or wood at Patio Furniture USA, a Hayneedle store. The discounts offered are up to 40% with some "hot deals" as much as 52% below retail prices. Some products offer Delivery upgrades, such as white glove, room of choice, unboxing, package removal, etc. Patio Furniture USA customer reviews include positive experiences with customer service and quality products are reported. Cushion material is said to be high quality and well made. Many customers recommend this retailer to friends and will return to shop in the future. Max Furniture is an Internet retailer that offers 45% -75% off major brands and ships both from its own warehouses and directly from manufacturers. Visit the company's testimonial page to read reviews; the majority of the comments are positive about both product and quality. A fun website with daily deals that offers steep discount patio furniture. One thing that speaks of the value of this website is the choice of patio furniture cushions available with purchases. Nearly 40 different colors and patterns are available for you to choose from. Take advantage of the annual closeout and clearance on patio furniture collections. Cozy Days Customers remark on high quality of products and service. Customers report being pleased with their purchases. OneWay Furniture buys directly from the manufacturer. Customers realize a 30%-70% savings. The company contracts with the manufacturers to ship directly to their customers. OneWay has over 300 national warehouses and deliveries are made within 1-2 weeks. OneWay Furniture customer reviews show customers are consistently pleased with their purchases. Shopping locally can yield some great finds at greatly reduced prices. Stock may differ from store to store; sometimes stock is moved to specific stores for quicker reduction of inventory. Big Lots is a closeout retail chain in the U.S. that carries quality merchandise. The website features the latest weekly ad flyer, but you can't make purchases online. You must visit a store for all purchases. You can sign-up online to receive email notification of the weekly ad flyer for your local store. 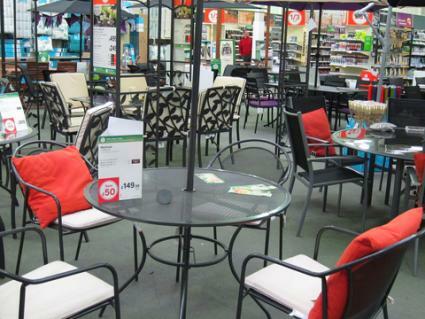 Big Lots carries a large selection of furniture, including patio furniture. You can find what's currently been marked down further via the flyer and also check the store for any special buys that may be exclusive to your local store. Many of the patio sets advertised include powdered steel dining tables and chairs with cushions and wicker dining chairs, outdoor living room chairs and rockers with cushions. Big Lots customer reviews are often varied with posts on Yelp and local websites giving positive reviews for product quality and pleasant local store service. Overstock is a mixed bag of patio furniture but you can find some great deals. All purchases over $50 are always free shipping. Sears Outlet offers up to 40% or more off patio seating and dining sets with cushions. Find the item you like and check if it's available at your local store. If not, pay shipping and have it delivered. Sears Clearance lists discounted furniture up to 50% that can either be sent for in-store pickup or shipped. Check local retail chain stores such as Target and Walmart for end-of-season discounts on patio furniture for even bigger discounts. Whenever shopping at discount or closeout venues, pay close attention to the finish and any warranties on how the furniture should perform outside in harsh elements. Take your time in deciding which patio furniture you wish to purchase so that you buy quality pieces that will serve you for many years.